Jay-Be have a new range of fabric sofa beds including a classic and a modern 2 seater fabric sofa bed both of which are available in luxury woven fabric with 20 colour options to choose from. The image above shows the Jay-Be Classic 2 seater sofa bed in Duck Egg fabric. These sofa beds are suitable for everyday use whereas most other sofa beds are for occasional use only. Jay-Be sofa beds are ideal for those in a city loft apartment and anyone a bit short on space - no need to buy a sofa and a bed separately - save space and buy a Jay-Be luxury sofa bed from Harvest Moon. These are the Rolls Royce of sofa beds, UK made in Yorkshire, featuring solid steel welded frames with a lifetime guarantee, pocket spring mattresses and a choice of 20 different British made woven fabric colour options giving a luxurious feel as as well as being a long lasting durable fabric. See further below for pictures of all the different colour options. We also offer the rest of the range of JayBe sofa beds and all their folding guest beds including contract folding beds. All Jay-Be furniture is made right here in the UK. Support British manufacturing by buying a Jay-be sofa bed or folding guest bed from Harvest Moon today! We offer a quick 4 week 2 man FREE delivery to the room of your choice including assembly and removal of packaging to UK mainland addresses on all Jay-Be sofa bed orders at Harvest Moon. The Jay-Be Classic sofa bed is a 2 seater sofa with a pocket sprung mattress that quickly turns into a 4ft double bed. For those who enjoy the best, this Jay-Be fabric sofa bed combines the latest fillings and patented Micro Pocket Spring technology to create a comfortable everyday sofa which turns into a luxurious bed in seconds. 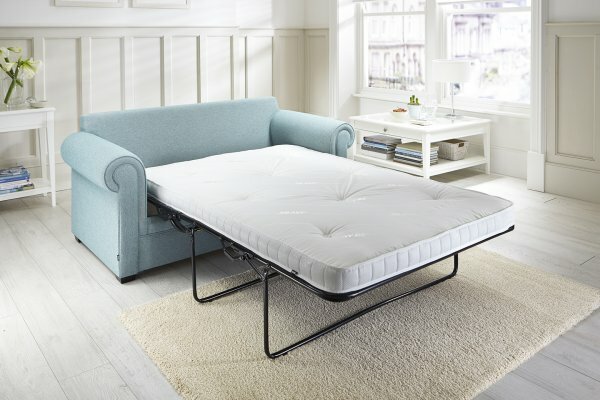 The exclusive mattress has over 1600 individual pocket springs (based on a 5ft mattress) which adapt to the contours of the sleeper’s body for supreme comfort. The image above and the two images below all show the JayBe Classic sofa bed in Duck Egg fabric. The Classic sofa bed is also available in the full range of Jay-Be fabric finishes, click here to see them all. The images directly above and below show the Jay-Be Classic sofa bed opened out as a 4ft double bed. To see how easy it is to turn the Jay-Be Classic sofa bed from a sofa into a pocket sprung double bed watch the short video below. (Approx 35 seconds). The dimensions for the Jay-Be Classic sofa bed can be seen in the diagrams below. The Jay-Be Modern sofa bed is a stylish 2 seater sofa with a pocket sprung mattress that quickly turns into a 4ft double bed. Like the Classic sofa bed but with a modern design the Jay-Be fabric sofa bed combines the latest fillings and patented Micro Pocket Spring technology to create a comfortable everyday sofa which turns into a luxurious bed in seconds. 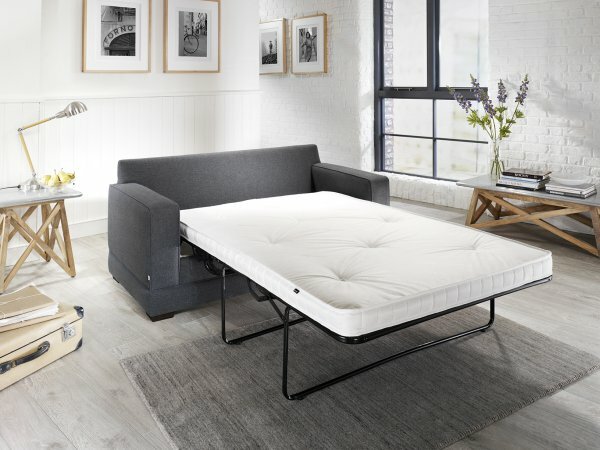 The exclusive mattress has over 1600 individual pocket springs (based on a 5ft mattress) which adapt to the contours of the sleeper’s body for supreme comfort. The Modern sofa bed has the same size mattress as the Classic but is a little more compact as a sofa, so if every centimetre counts this is the one to go for. The image above and the two images below all show the Jay-Be Modern sofa bed in Denim fabric. The Modern sofa bed is also available in the full range of Jay-Be fabric finishes, click here to see them all. The images directly above and below show the JayBe Modern sofa bed opened out as a 4ft double bed. To see how easy it is to turn the Jay-Be Modern sofa bed from a 2 seater sofa into a pocket sprung double bed watch the short video below. (Approx 35 seconds). The dimensions for the Jay-Be Modern sofa bed can be seen in the diagrams below. See below for the 20 different colour options you can choose from when you buy your new Jay-Be fabric sofa bed from Harvest Moon today.